The Intermediate Inventory feature allows the user to prepare ingredients / modifiers / products in advance by running recipes for each, ahead of time. To support this, Revel has added a "Prep Recipe" setting for modifiers, ingredients, and products, nested inside the details page, under the "Recipe" section..
Navigate to an Ingredients or a Modifiers details page. Using the Recipe section, click "+Add New Ingredient" and search for, or select an ingredient from the dropdown menu. Enter in the quantity and repeat steps 4-5 for the rest of the ingredients. Hit Save in the top right. 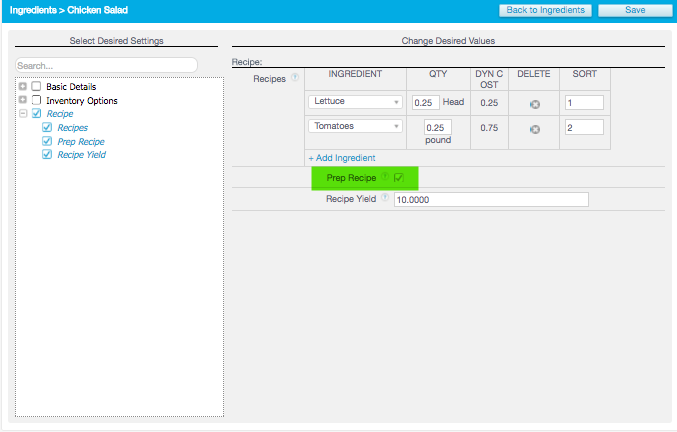 After creating a recipe, users that prepare products, modifiers, or ingredients prior to selling them should check the "Prep Recipe" box and enter a value in the "Recipe Yield" field, which will be used as the default yield, meaning, the amount a recipe should generate. Note: "Recipe Yield" applies only to Prep Recipes and is ignored if the recipe is not a Prep Recipe. If the Prep Recipe setting is not enabled, the recipe will be consumed at the time of sale. Once these settings are properly configured, the user will need to run the "Prep Recipe" tool, referenced in the next section. Otherwise, the ingredient(s) will be consumed at the time of sale. The "Prep Recipes" tool has been added to the Inventory page, as shown below. This page will include a list of all the products, ingredients, and modifiers whose recipes are marked "Prep Recipe". Clicking next to the recipe will allow the user to adjust the values for each ingredient, as well as the number of times it is run by the actual yield. The user may run the recipe by clicking which will then take the ingredients out of the inventory and put the result into the inventory. The cost of the result will be based on the costs of the ingredients at the time the recipe is run. Note: Users may set an "Actual Yield" in case they do not get as many products as they had expected for the ingredients used.